This is a great trail race for just about any runner. As trail races go, it’s very approachable, some technical components here and there, but nothing crazy. From my perspective it is completely run-able, whereas some trail races have sections here and there that become mini-hikes in the middle of a trail race. The 19th annual Dupont Trail Race will take place on Saturday, March 30th this year, and for those of you who haven’t run it yet, this is the year to sign up. Why? Because it’s 7.4 miles of awesomeness through beautiful Dupont State Recreational Forest, which is less than an hour’s drive south of Asheville (between Hendersonville and Brevard). The terrain is challenging but not too technical, so it’s a perfect first time trail race. I ran it as my first trail race last year and I definitely felt challenged, but not defeated. The course was enjoyable and easy to follow, and there were these amazing chocolate chip cookies at the end so I’ll definitely do it again this year. Asheville firefighter Mikey Riley (pictured above) is a huge fan of the DuPont Trail Race and says he looks forward to it every year. A long-time Maggot runner who is well known in the Asheville running community (and not just for his tattoos), Mikey logs roughly 3,000 miles annually and has run the Dupont Trail Race six times. It’s his favorite race of the year. Mikey won the DuPont Trail Race twice. In fact, he won it the first time he ran it. That’s raising the bar just a tad, but for all of you regular trail runners this is a fun first trail race to try that’s open to all skill levels. To prepare, Mikey suggests having a couple of practice trail runs under your belt at a 7 to 8 mile distance. Also be sure to watch the weather and dress accordingly. It does tend to rain in Dupont, so do bring a hat, gloves, and rain gear and be prepared for cold, soggy weather. 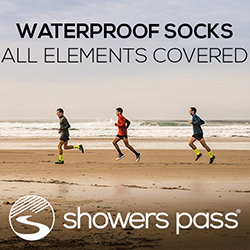 Definitely bring clothing for after the race as well, such as dry socks and shoes, so you don’t drive home with wet feet. For weather information, you can check out DuPont’s Weather station. As for nutrition, bring one or two GU energy gels or whatever nutritional supplement you prefer, and a little water. Snacks and food are provided after the race, along with some nice hot coffee and race swag. DuPont State National Forest is a beautiful area; your kids can ride bikes or hike while the race is going on, and Mikey says he and his family always stop for lunch in town afterwards. If you’re driving to DuPont Trail Race for the first time, try to go with someone who has been there before, or give yourself extra time. The race start is a bit hidden, but there will be signage to help guide you. Jus’ Running is the main sponsor of this race and all proceeds go towards DuPont State Recreational Forest. Come out and enjoy a challenging yet fun morning on Saturday, March 30th, and enjoy a scenic run through rolling trails. The race starts at 10:00 so you can sleep in.